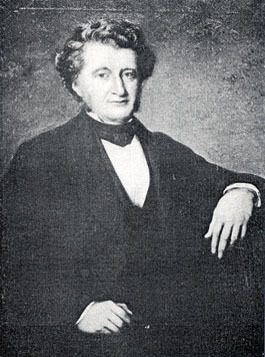 Brongniart is often recognized as the "father of paleobotany," and as one of the most prominent botanists of the nineteenth century. While he is perhaps best known for his central role in clarifying the taxonomy of extinct forms, his work extended to many other areas of botany. Thus, he also did research on the sexual morphology of plants and their fertilization process, cytology (he was one of the first to routinely employ thin-sectioning as an analysis method), plant distribution, and the systematics of living plants. His plant classification system became the basis for the one later developed by Adolf Engler. --born in Paris, France, on 14 January 1801. --dies at Paris, France, on 18 February 1876. --Encyclopaedia Britannica, Eleventh Edition, Vol. 4 (1910). --Revue Scientifique, Vol. 10 (1876): 564-574. --Une Grande Famille de Savants: Les Brongniart (1940). --Taxon, Vol. 15(8) (1966): 320-324. --"Historical Review of Paleobotanical Discovery," Fifth Annual Report of the U. S. Geological Survey (1885): 368-425.